A list of recipes for homemade wine, mead, cider, and liqueur – a great place to start. How do you juice rhubarb? I’ve tried things like cutting it up and putting it in a blender and soaking in water. The best ways to “juice” rhubarb are freeze/thaw and sugar extraction. I usually do both. As you harvest the rhubarb, wash it and cut it up into 0.5 inch (1.25 centimeter) pieces and freeze them. When you are ready to make wine, thaw the rhubarb and put it in a strainer. I usually get 2/3 – 3/4 cup/pound (350-400 ml/Kg) of rhubarb juice this way. Once you’ve strained the juice, sulfite it. Next, place the rhubarb in a container and cover with about 1 lb (about 450 grams) of sugar. Let it sit until the sugar has dissolved (about two or three days), then strain off the liquid. Place the rhubarb back in the container and cover with water for a few hours or overnight. This is a rinse to get every last bit of “rhubarbness.” Strain the liquid and discard the spent rhubarb. At this point, I dissolved the tannin, DAP, and pectic enzyme in 0.25 cups (about 60 ml) of water and added it to the liquid. I repeated the sugar extraction step, so I used 2 lb (about 825 g) of sugar, and ended up with 2.36 quarts (2.23L) of SG 1.114 liquid. I’m going to switch to metric measures, because calculations are easier, and report numbers with much more precision than I can measure so that I don’t carry rounding errors from one step to the next. I’m aiming for 5.68L of must with an SG of 1.090. Adding 3.568L of SG 1.075 sugar water will yield 5.8L of 1.090 must. An SG of 1.075 implies 232 g of sugar in each liter of solution (not 232 g added to 1L of water!). So 3.568L at 232 g/L means 828 grams of sugar. I boiled 1L of water, took it off heat, dissolved the sugar, and brought it back to a boil. Once it was boiling, I took the pan off the heat and cooled it in a water bath for 15 minutes. I used a measuring cup to determine the volume of sugar water (1.45L) and added it to my fermenter. Then I added tap water until I reached 3.568L total. I added the sugary rhubarb juice to the sugar-water in the fermenter and measured the specific gravity. I should have 5.8L of SG 1.090 must, and I measured the SG as 1.095 – my kitchen scale and measuring cups were never going to be very accurate, so I’m calling that good! What about the pH and titratable acidity? If you’ve read many of my posts, you’re probably wondering why I haven’t mentioned the acidity of the must. I’m always going on about how important pH is to stability and titratable acidity (TA) is to taste. What’s going on? I’ve made rhubarb wine for years, and I’ve found that using rhubarb at a rate of 1.5-3 lb/Gallon (180 – 360 g/L) of must consistently gets me close to 6 g/L acidity. So I’ve decided to wait until it ferments out, then measure the acid and make any corrections. Isn’t the oxalic acid dangerous? Some wine makers neutralize virtually all the acid in rhubarb, then add back acid (tartaric, citric, or a blend). They do this to remove the oxalic acid, which is toxic and present in rhubarb. Removing the oxalic acid will change the wine; I think it detracts from rhubarb’s unique character. Most of the oxalic acid is in the leaves, and I make rhubarb wine with the stalks only (so should you!). It’s true that the stalks contain some oxalic acid, and while I don’t know what the precise amount is or exactly how much of this acid can be dangerous, I can tell you that I’ve made – and consumed – rhubarb wine this way for years with no ill effects. Obviously, I wouldn’t be doing this if I thought it was harmful, but you’ll have to make your own judgment about that. With nothing left to do, it’s time to pitch the yeast. They’re the real wine makers, and they should have this must turned into wine in the next week or so. Then I’ll rack as needed, and bottle in about a year. It’ll be drinkable soon after that, but it ages very well, so keep a few bottles if you can. 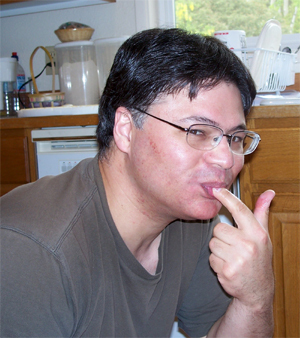 This entry was posted in Recipes, Rhubarb Wine on January 23, 2008 by Erroll. I sowed seeds that sprouted into seedlings. I transplanted the seedlings to beds. I fussed over the tomato plants. I planned. I harvested. Now, at last, I’m finally making tomato wine! Make a yeast starter and set it aside to grow. Juice the tomatoes and pour it into the fermenter. Dissolve the sugar in the water, boil, cool, and add to fermenter. Add sulfite, pectic enzyme, diammonium phosphate, and tartaric acid. Pitch the yeast starter when it is active. My actual sugar and acid levels came out a little higher than I predicted, probably because my weight and volume measurements are imprecise – close enough. Now I’ve got a little under three gallons of sweet acidic tomato juice. I don’t know what tomato wine is going to taste like, but this juice is really odd. There is a strong flavor of tomato, which I like but is completely out of place in such a sweet juice. I hope the yeast like it, because I just pitched the starter. Update 2/28/2008: Too much acid! After fermentation, I measured the TA at 9-10 g/L. An error in my measurements might explain the apparent jump. I took two measurements just before pitching the yeast, however, and they were consistent with each other. I took two more measurements after it had fermented out, and they were both showed an increase of 2.5-3.5 g/L. I know that some acid forms during fermentation, but this much? I’m not sure what happened here, but I think the lesson is to wait until your wine is fermented out before you adjust your acid. This entry was posted in Recipes, tomato wine, winemaking on December 22, 2007 by Erroll. I made raspberry wine last year. I haven’t talked about it before because I made it and racked it before I started blogging. I also made it before I owned a pH meter or an acid test kit, so I was really flying blind. How do you make raspberry wine without measuring the acidity? I measured what I could, then I consulted Ben Rotter’s table of fruit data. It’s a goldmine of data about sugar, acid, and tannins in fruit as well as juice yield. My 10.75 lb (4.9 kg) of raspberries yielded 3 quarts (2.8 liters) of SG 1.050 juice. My notes show that I expected a TA of 14-18 g/L, though when I look at the table now that seems low. I picked the fruit at a U-pick farm after some unusually hot weather. My notes don’t say, but maybe I was expecting the hot weather to lower the acid. At any rate, I dissolved 3 lb (1.4 kg) sugar in 3.3 quarts (3.1 liters) of water. I treated with sulfite, pectic enzyme, and nutrient then pitched the yeast. It fermented to dryness in less than two weeks. Raspberry Wine: How the pros do it – How commercial raspberry wine is made, and what home winemakers can learn from it. Raspberry Wine: A look at existing recipes – Home winemakers do it differently. The hows and whys of homemade raspberry wine. It tasted tart, but it wasn’t the undrinkable firewater you might expect. There was a very nice flavor in there, and it complemented the raspberry aroma very well. I decided to use potassium bicarbonate (KHCO3), to take down the acid a notch, at a 1.5 tsp/Gallon (2.4 g/L) rate. I’m hoping to reduce the acid by 2-3 g/L. I’ve set it aside, with the cherry wine, and intend to taste them both in a few months. Maybe that’s all the raspberry wine needs, or maybe the acidity will still be too much. If so, it’ll be time to sweeten it a little. I think this is going to have a happy ending, but you really should do your own measurements. Bookmark Ben’s site, and not just for the fruit data, and use it to help make your own recipes, but make final decisions about acid and fruit proportions based on accurate measurements of the fruit you are using. It’s still too tart, even after neutralizing some of the acid, so I sweetened my raspberry wine. This entry was posted in enology, Raspberry Wine, Recipes, winemaking on October 3, 2007 by Erroll. And you thought tomato wine sounded strange! Years ago I started an oregano bush from seed. Each year I harvest a little for cooking, but it’s huge and most of it goes to waste. What’s a winemaker to do? Use this recipe from Terry Garey’s Joy of Home Wine Making , my first winemaking book. It’s a great way to start – it’s how I got started – making your own wine. Initially, you will need a fermenter, hydrometer, thermometer, stirring spoon, measuring spoons, and a couple of pots. Later, we’ll use a gallon jug, a racking cane, some siphon hose, and pH papers. Start by sanitizing the clean equipment by immersion in boiling water or sanitizing solution. Harvest about 6 cups (about 1.5 liters), lightly packed, of oregano. Then remove dead leaves and any other plants that have gotten mixed in. After a quick rinse in cold water, place the oregano in a 2 quart (2 liter) saucepan, add 1 quart (1 liter) water, and bring to a simmer. As soon as it started simmering, take it off the heat and let sit for 1-2 hours. In the meantime, I dissolve the sugar in boiling water. Strain the oregano and add the sugar water. Next, I dissolve the tannin and nutrient in water and add to the fermenter. Wait until fermentation is complete before adding the acid because the pH could drop too much during fermentation and inhibit the yeast. Finally, I add 1 tsp of sulfite solution (equivalent to 1 campden tablet). Always take a hydrometer reading before pitching the yeast. I recorded a specific gravity of 1.108 @ 82 Fahrenheit (about 28 Celsius) when I made this recipe. My hydrometer is calibrated to work at 60F (15.5C), and I adjusted for the higher temperature with a lookup table. The adjusted SG was 1.110, so the potential alcohol was 15%. I thought it might turn out to be high, but I like to follow recipes closely the first time. I’ll probably cut the sugar and aim for and SG of 1.090 (12% alcohol) the next time. At this point, turn if over to the yeast. Once fermentation subsides, rack the wine to an airlocked glass jug. When fermentation is complete (check with a hydrometer), add the acid. This entry was posted in herb wine, Recipes on June 8, 2007 by Erroll. A fermenter, stirring spoon, 3+ gallon stockpot, and a hydrometer are needed today. A 5-gallon carboy, 1-gallon jug with drilled bunges to fit, airlocks, siphon hose, and racking cane will be needed later. This is available at any homebrew/winemaking shop. All your equipment (fermenter, stirring spoon, stockpot) should be clean. It’s also a good idea to sanitize your equipment by immersion in boiling water or sanitizing solution. You can buy a commercial sanitizer at any homebrew shop, or make your own. Measure one gallon of honey and dissolve into 2 gallons of water. 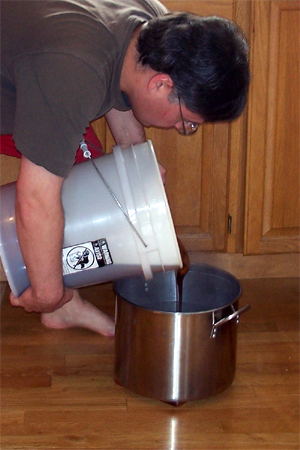 In the photo, I’m pouring honey from a 5-gallon bucket into a stockpot. The stockpot has markings at the 8 quart and 12 quart levels. I filled it with hot (just off the boil) water to the 8 quart line, then poured in honey until it reached the 12 quart line. So I’m using the stockpot as a large measuring cup. I used hot water so that I could dissolve the honey more easily. Next, fill the fermenter. In the photo at left, I’m pouring the 3 gallons of honey-water into my fermenter. After that, I dissolved the DAP and cream of tarter in a little water and stirred it in. Finally, I added 3 gallons of cold water and gave the whole thing a good stir. Take a sample to measure the specific gravity with your hydrometer. Make a note of this so you can compare it to the specific gravity of the fermented mead and estimate the alcohol content. Here I measured the SG as 1.080, which means the potential alcohol is about 11% by volume. A pH measurement can be useful too, but the total acidity that winemaker’s often measure is much less useful in mead.Once you’ve taken your sample, you can pitch the yeast. I made a starter the day before with about a quarter cup honey dissolved in a cup of water with a pinch of DAP and cream of tartar. This gave my yeast a head start, and I poured the starter into my fermenter after I drew my sample. I racked the mead into a new carboy and fined with bentonite. I racked off the bentonite sediment and onto some oak chips. I also adjusted the acidity. 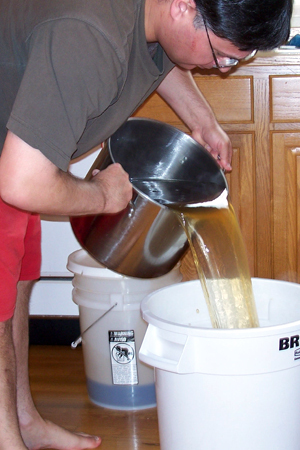 There are many different ways to make mead, and in June 2007 I briefly discussed three of my other meads as well as an apple wine. I bottled all four that day, including some of the first mead I ever made, a mead in honor of Brother Adam, and the most wine-like mead I ever made. Update 3/23/2009: Bottled – the mead tastes great! This is a simple recipe that turned out great – the only hard part was waiting. It was definitely worth the wait, and I would recommend this recipe to anyone interested in, or curious about, mead. This entry was posted in Mead, Recipes and tagged nad on May 6, 2007 by Erroll.